For the past few summers here at The A.V. Club, we have taken a week to look back at the corresponding year from 20 years ago. Who could forget the fun of David Anthony talking about his favorite movie Cool Runnings for 1993 week, the detailed description of Josh Modell’s 1994 mixtape, Erik Adams’ ode to his beloved issue of Entertainment Weekly from 1995, and Sean O’Neal’s eulogy for the death of alternative rock in 1996? Not to disparage those other ’90s years or anything, but 1997 week is going to be off the hook. Honestly, even we can’t believe how much stuff we have lined up. And it’s not all just about Titanic, we promise (only about 30 percent or so). Today, we kick off with an Inventory featuring all of 1997’s highlights and lowlights, as well as a Very Special Episode highlighting the aftermath of Ross and Rachel taking a break. A Crosstalk will look back fondly at the GoldenEye game, which some of us love more than any other. Other popular topics on deck for 1997 week include: the Star Wars re-release, Lilith Fair, “The Itchy & Scratchy & Poochie Show,” Wu-Tang Clan, and yes, Titanic. It was a really big deal, okay? 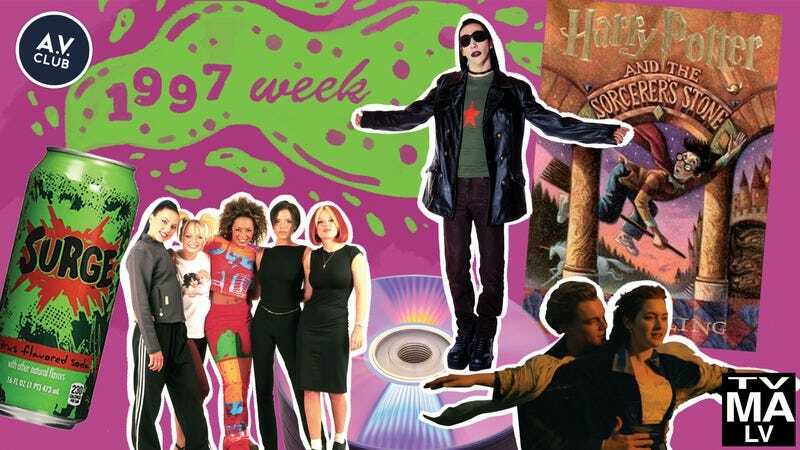 And there’s so much more to come in 1997 Week! So enjoy this time machine to 20 years ago over the next few days—to a simpler era when all we had to worry about was a really big iceberg and a really cloying Celine Dion song.